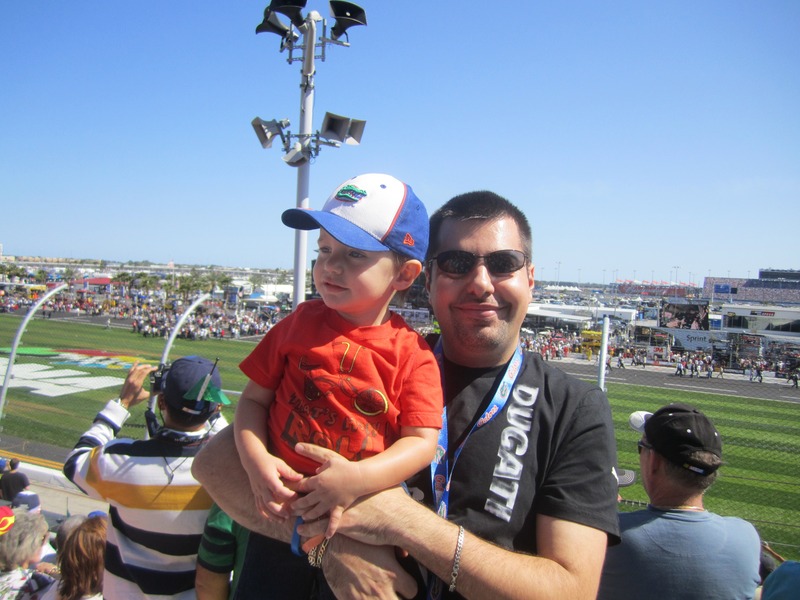 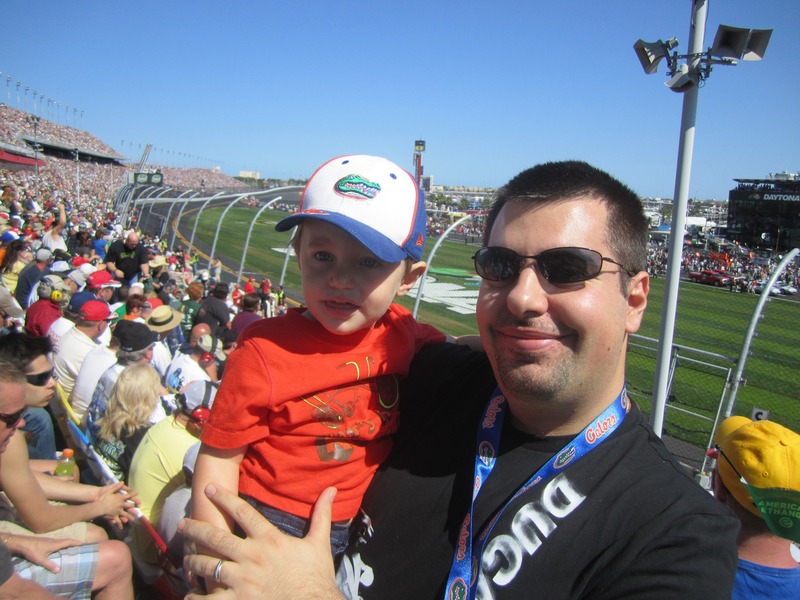 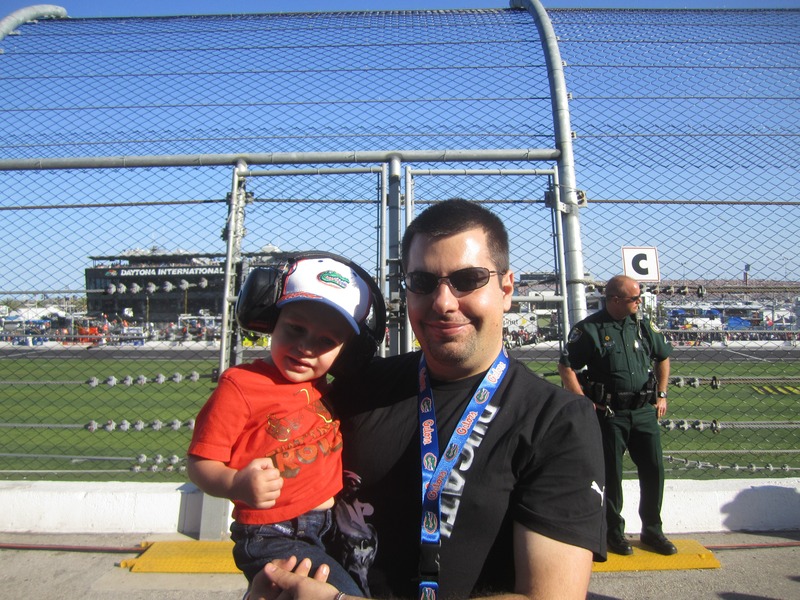 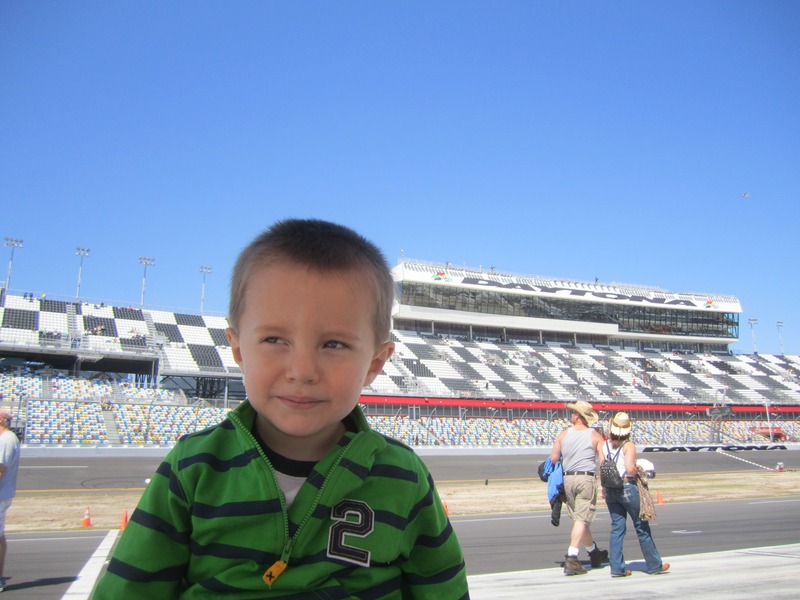 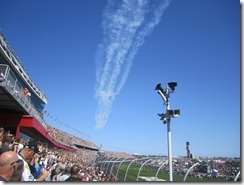 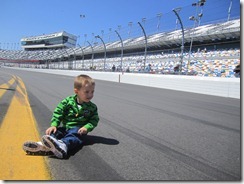 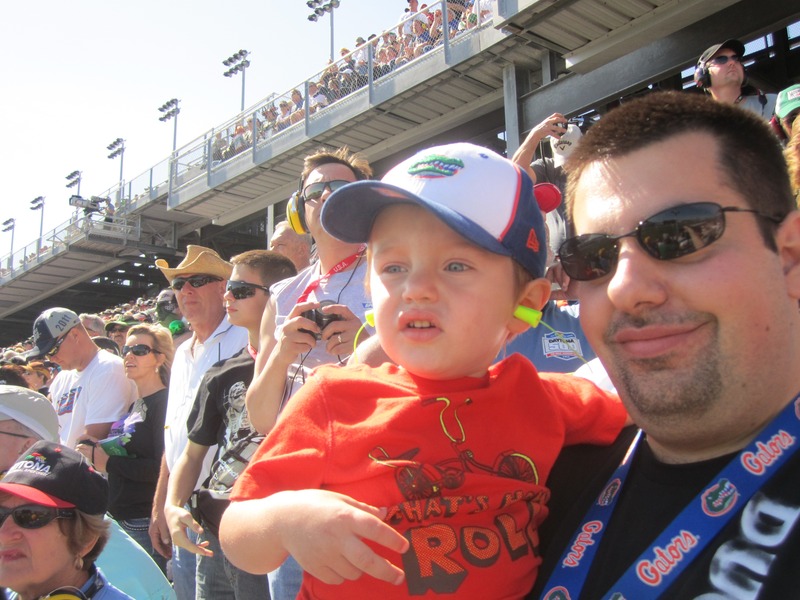 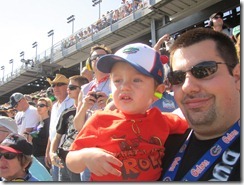 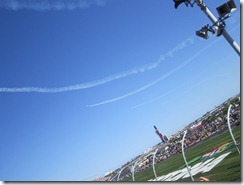 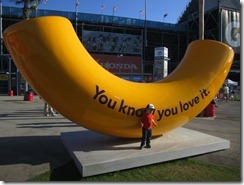 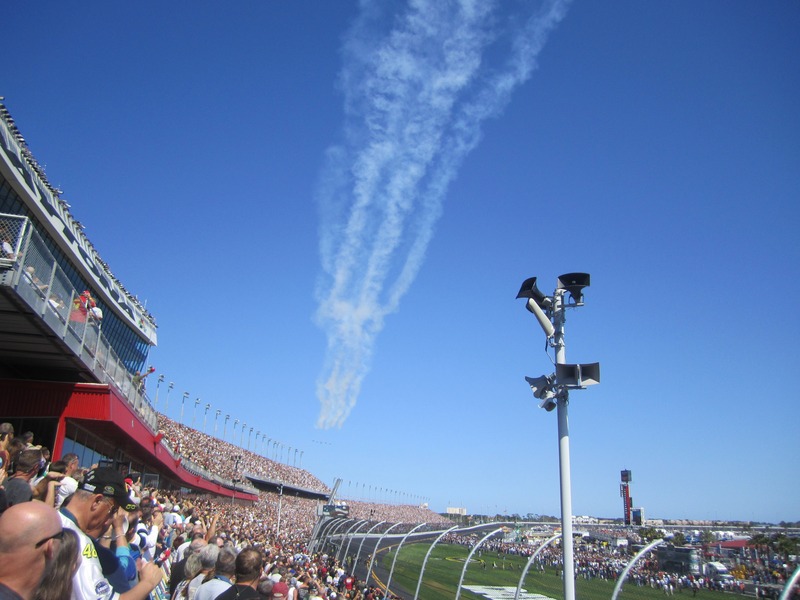 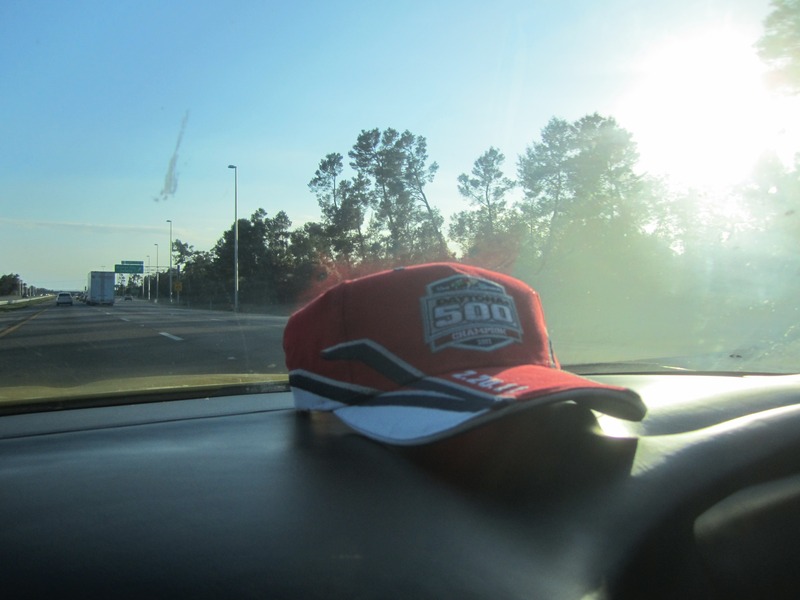 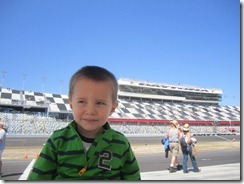 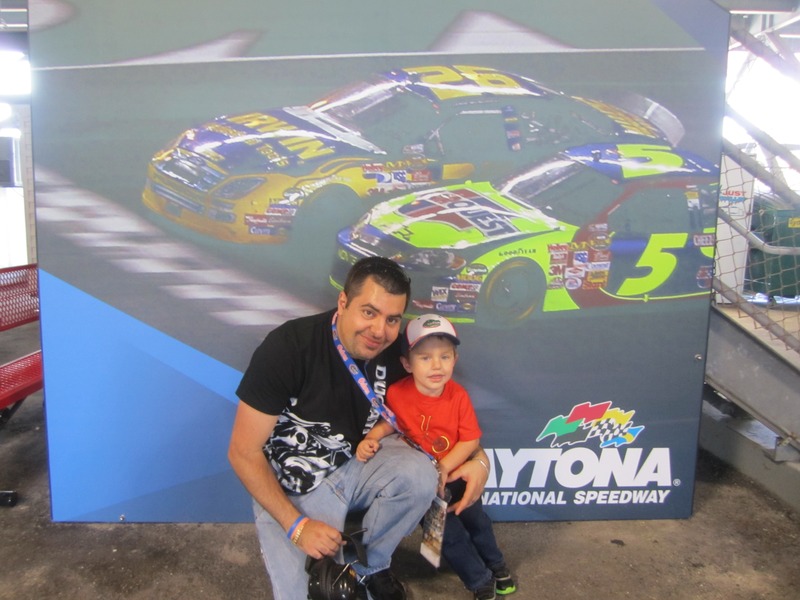 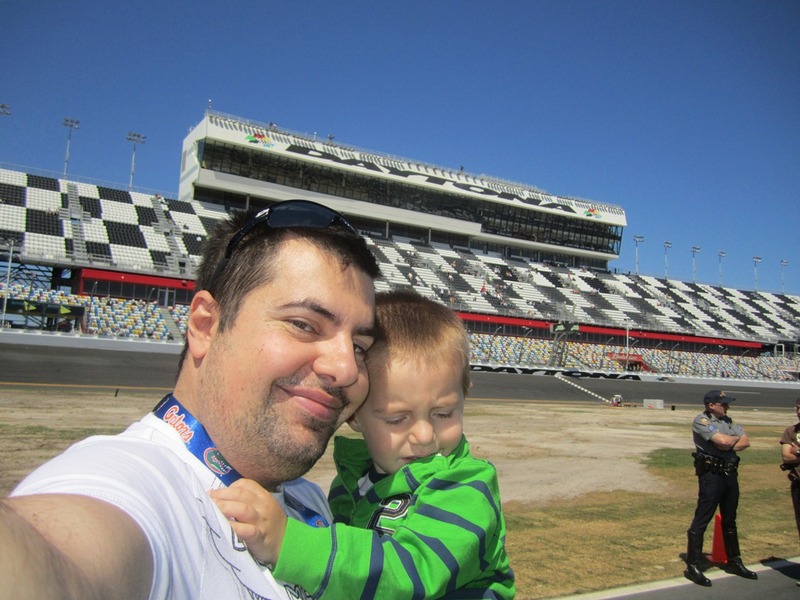 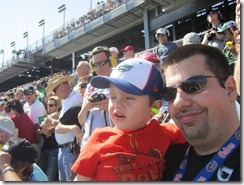 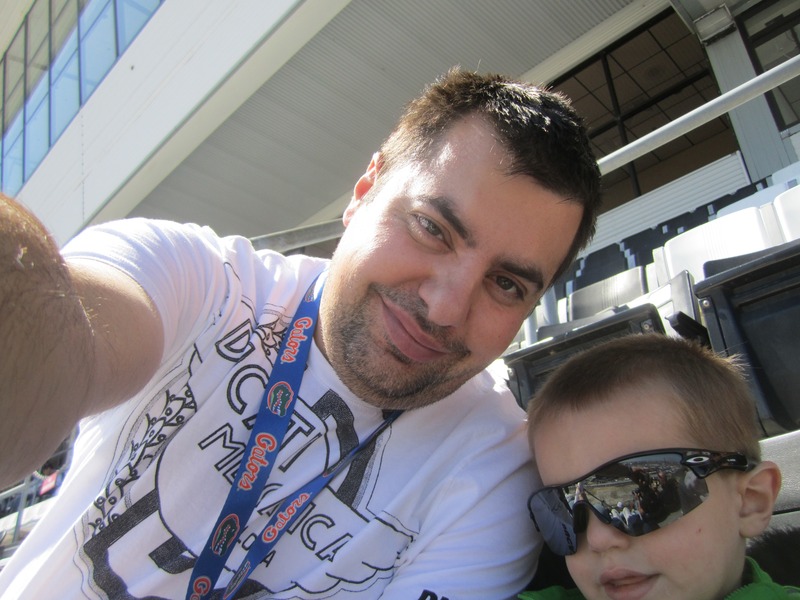 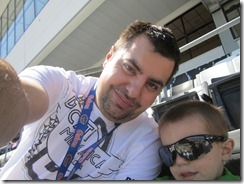 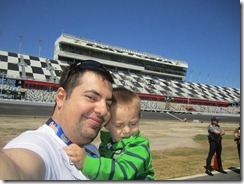 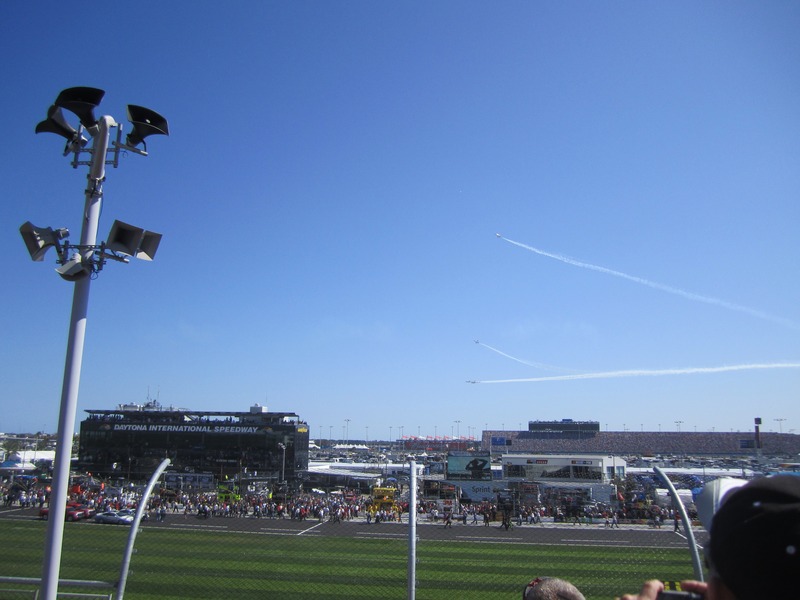 Earlier this year Timmy and I went to Daytona 500 which is the biggest race on the NASCAR circuit. 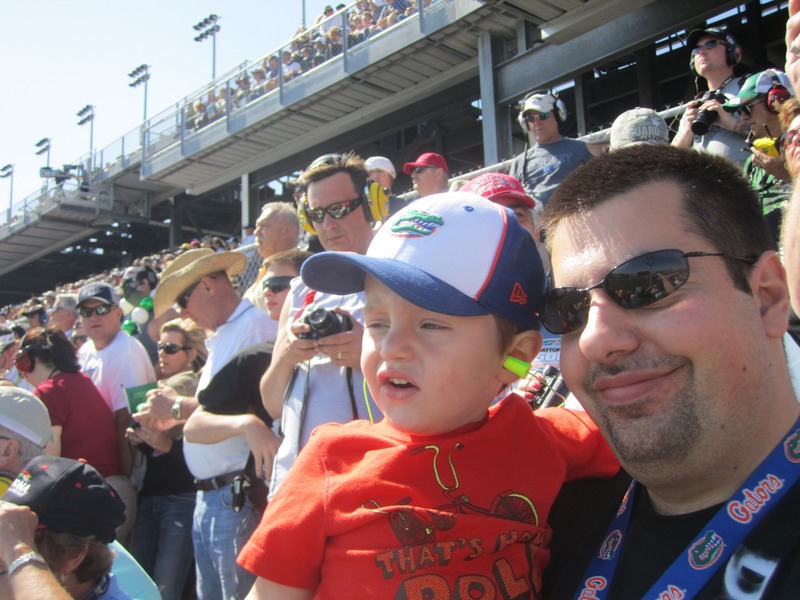 Literally every stereotype you can associate with NASCAR was present and although we had expensive seats the race and the crowd… not our thing. 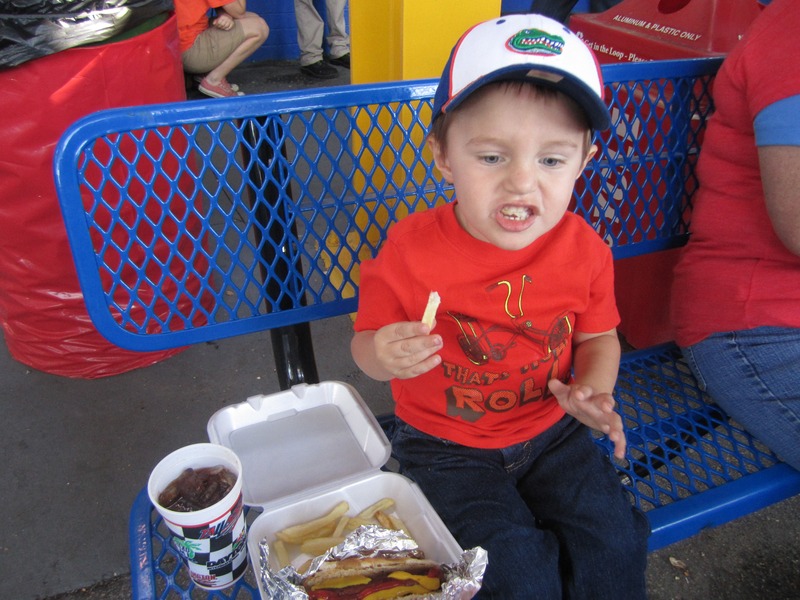 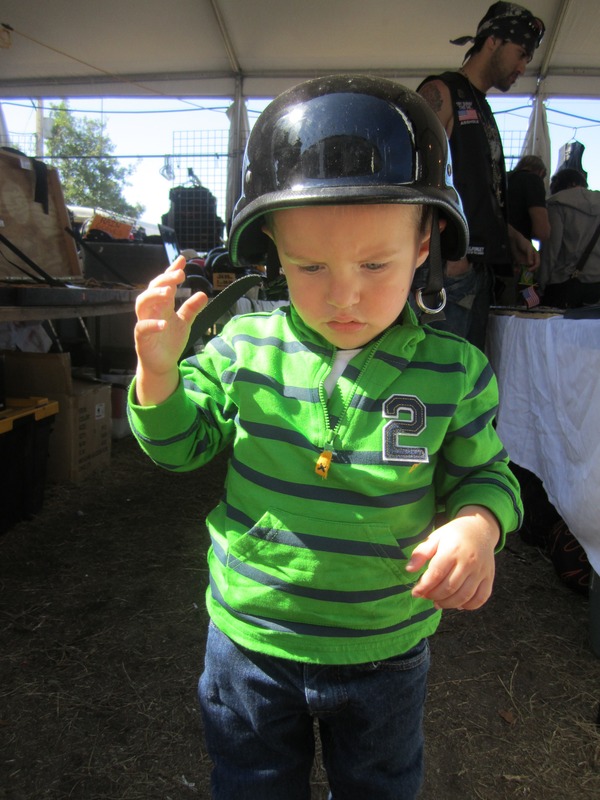 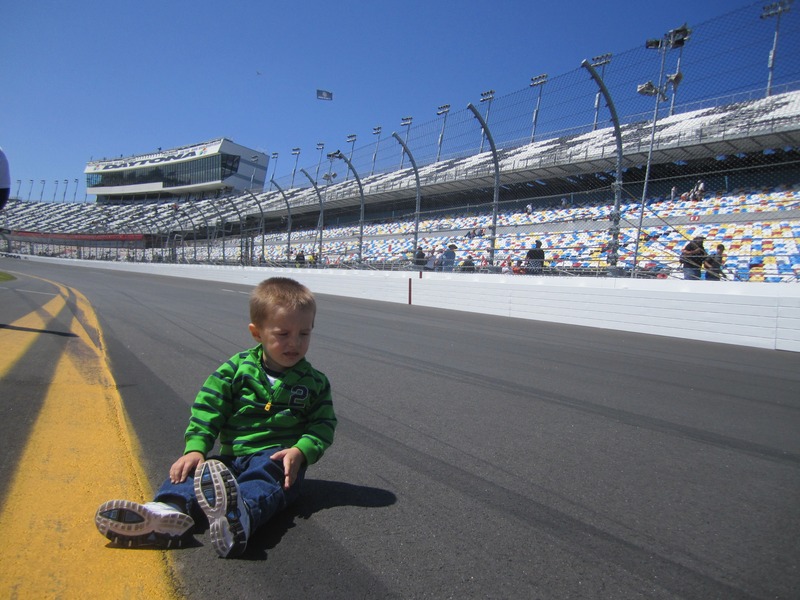 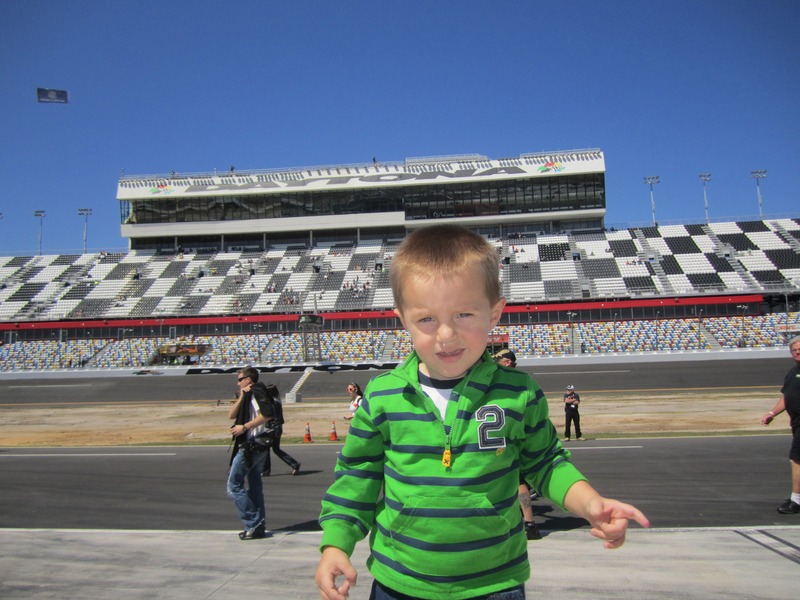 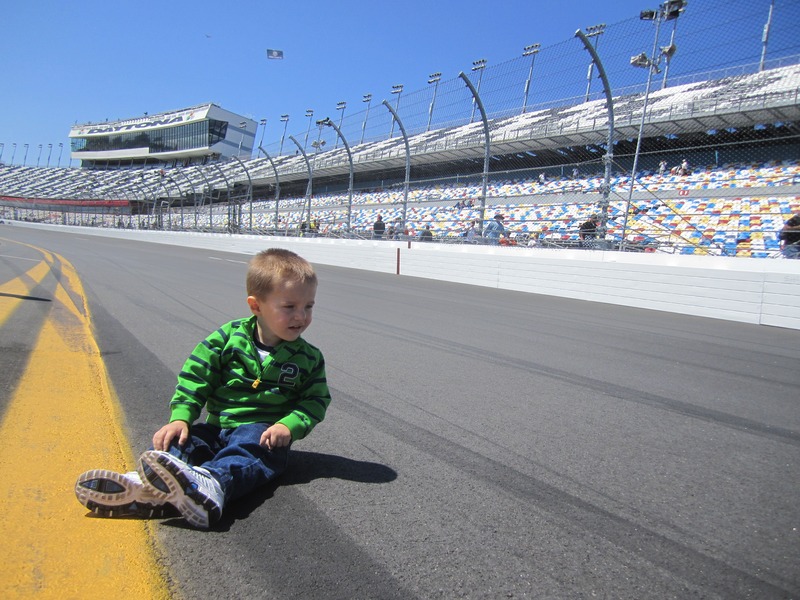 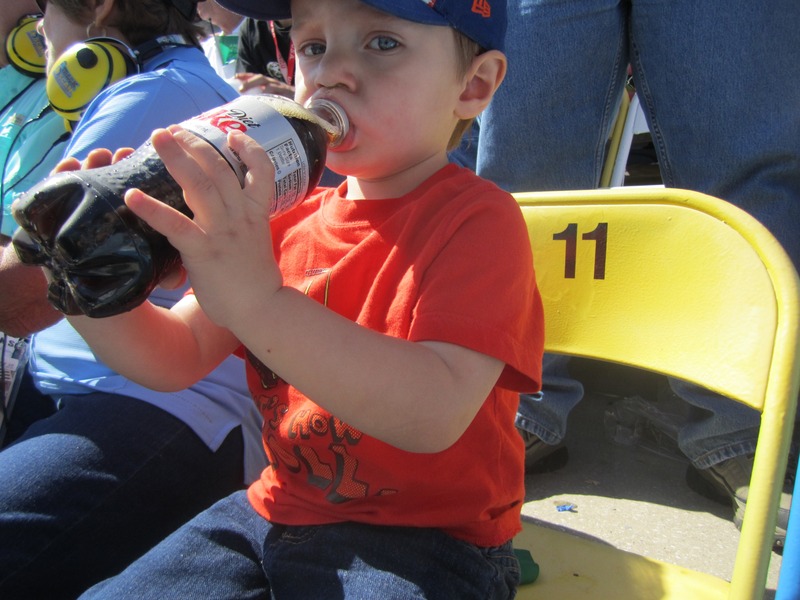 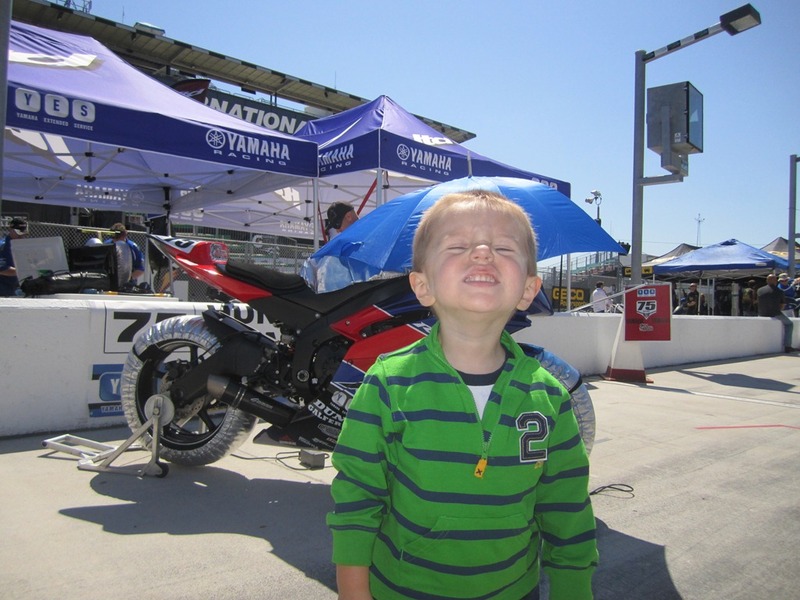 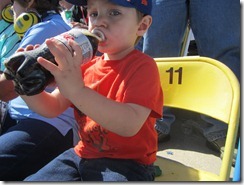 Timmy loved the car noise but about 20 laps he was ready to go home – “No Lightning McQueen?? 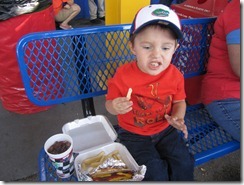 ?” – No son, just Larry The Cable Guy’s drunken cousins. 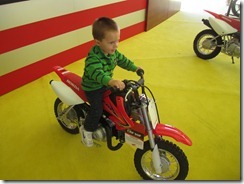 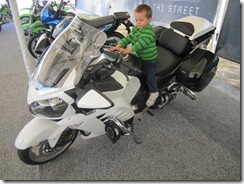 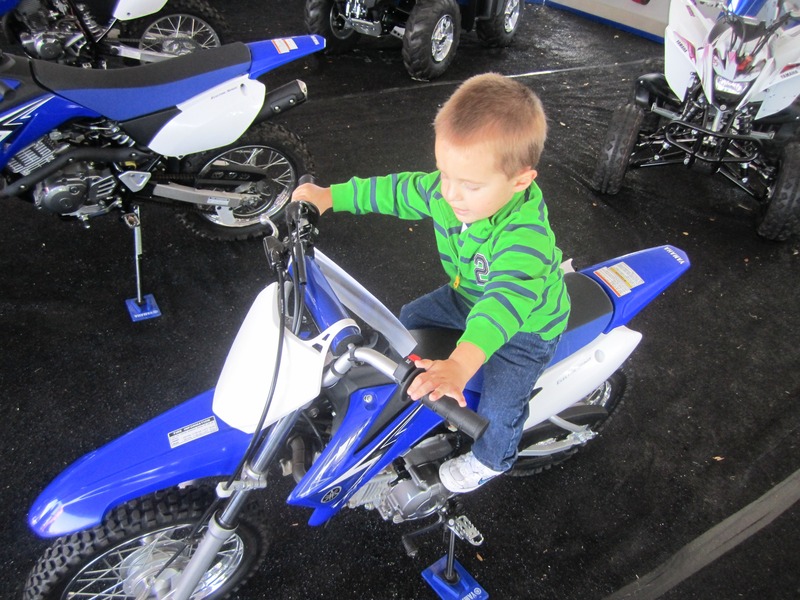 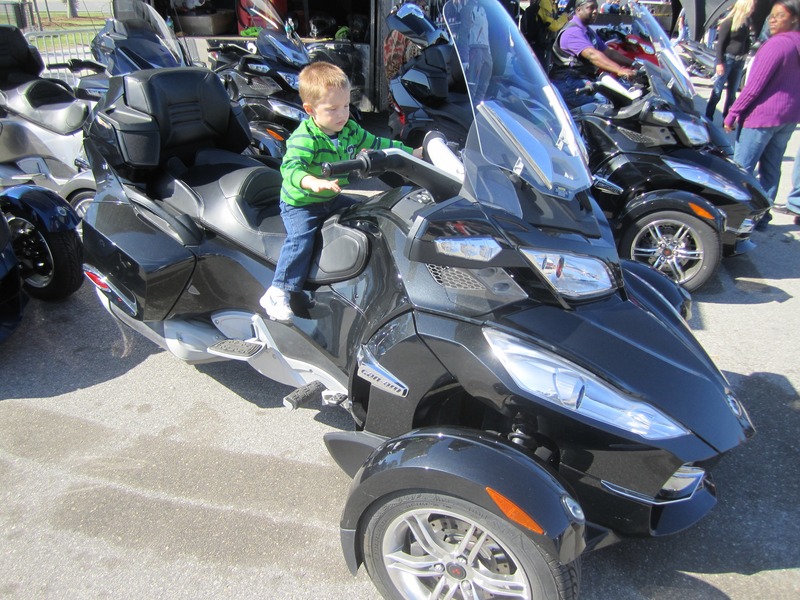 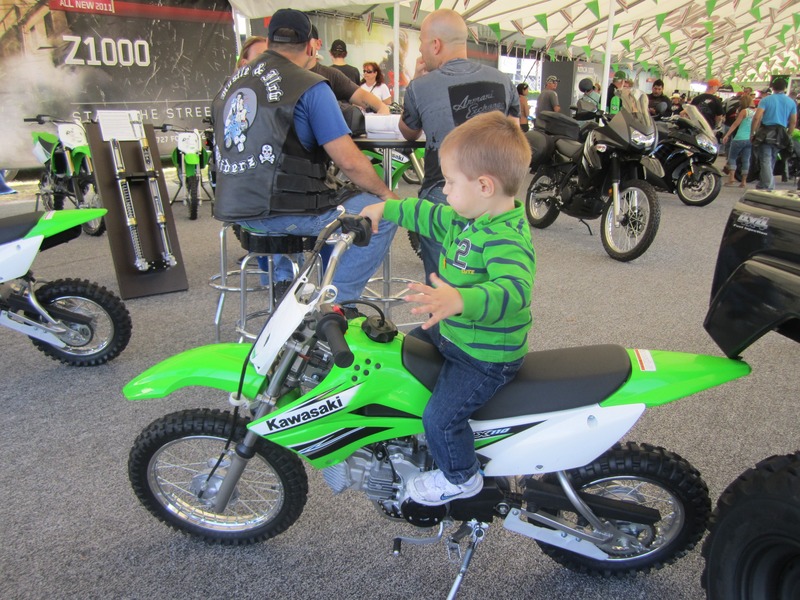 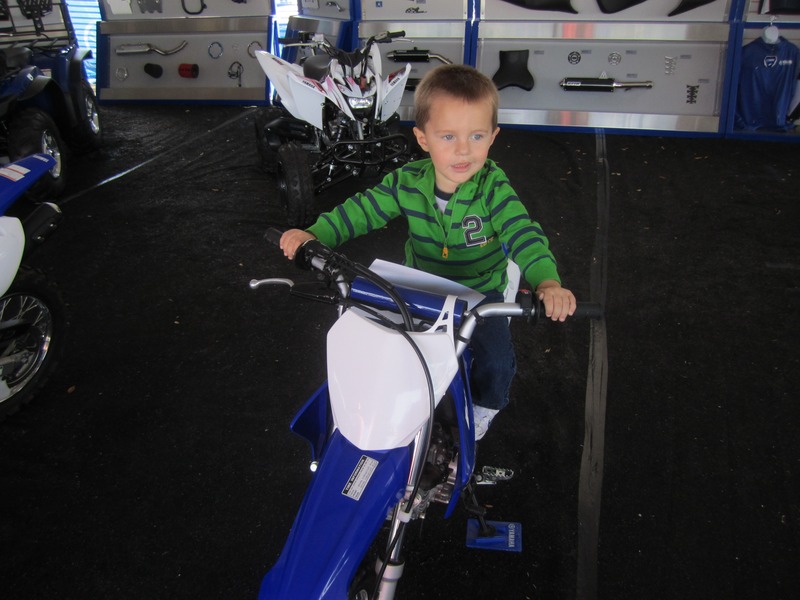 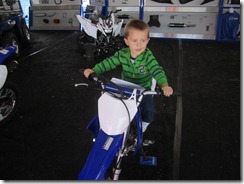 These are 50cc dirt bikes and while he can’t reach the pedals yet, I learned something interesting. 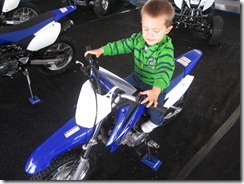 These dirt bikes come with training wheels. 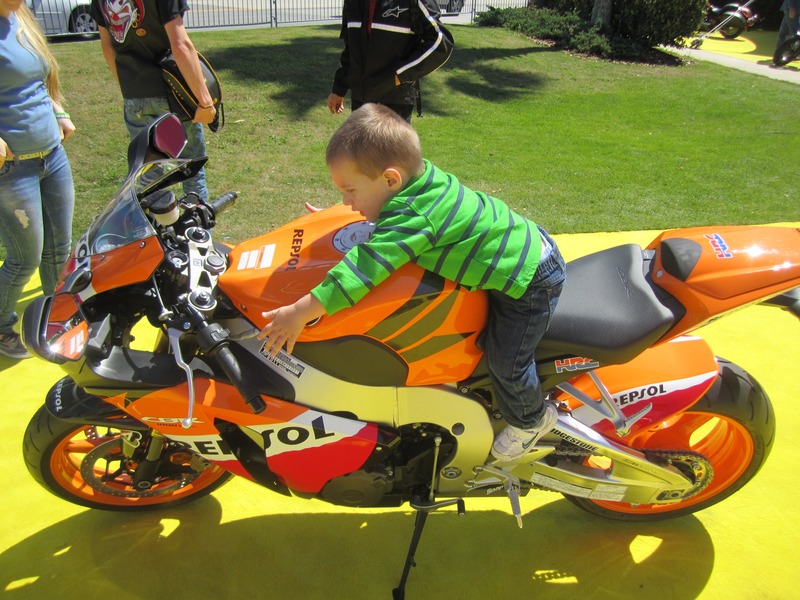 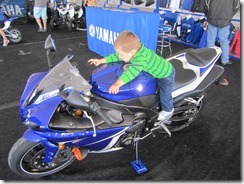 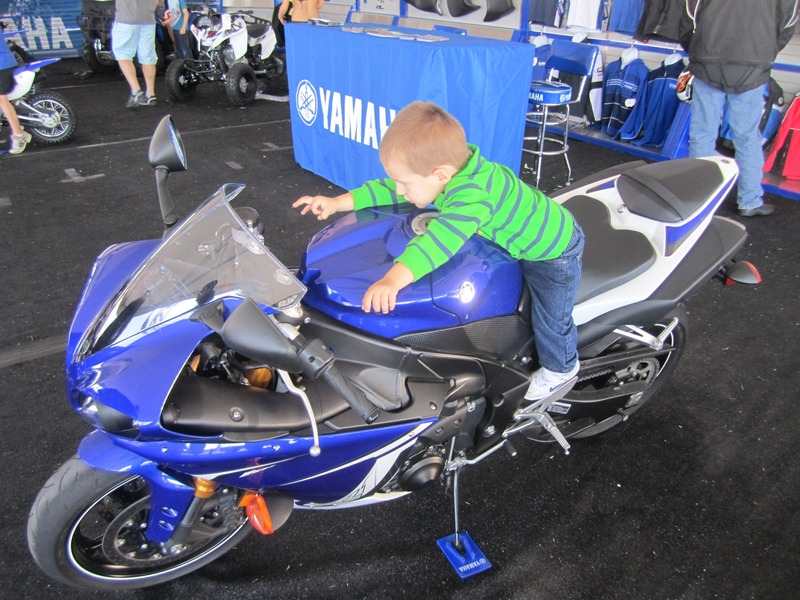 Yes, don’t worry about not being able to balance your bike, you can still help your kids reach breakneck speeds long before they make it to first grade. 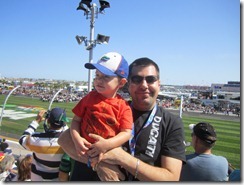 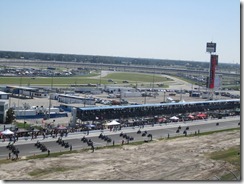 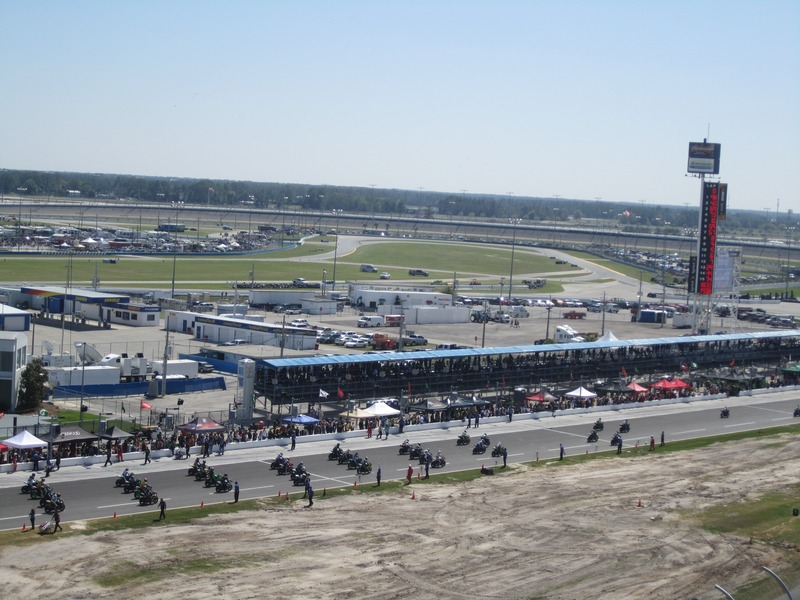 We then moved to superbikes, to the Daytona International Speedway where we sat on the track and hung out in the pit row. 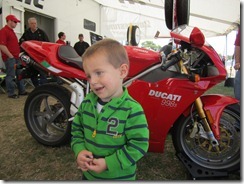 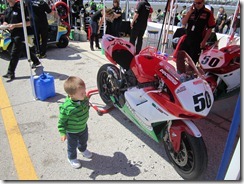 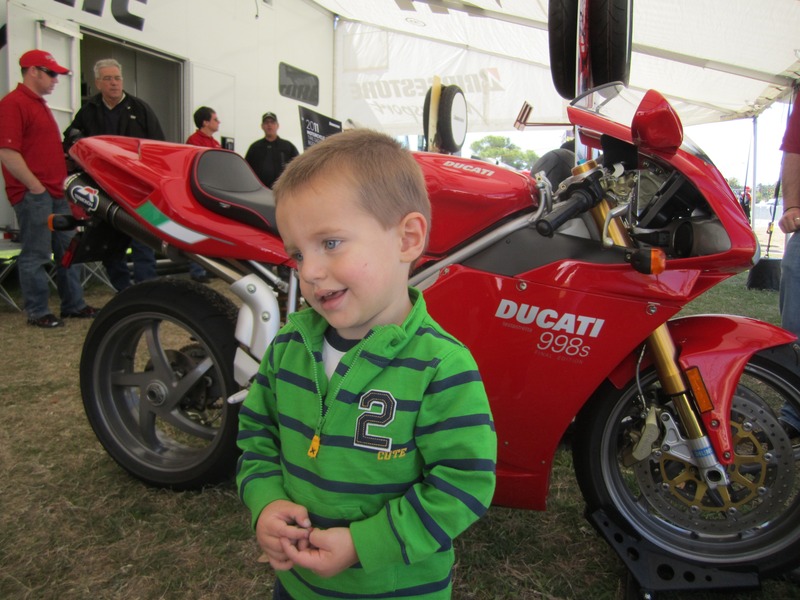 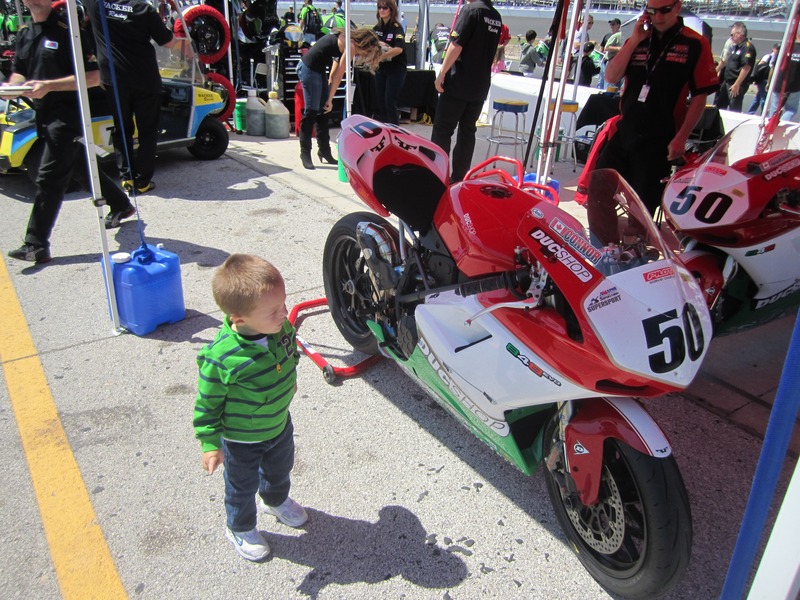 Timmy got to meet Jason DiSilva, who won the pole and eventually the whole race on a Ducati 848 EVO. 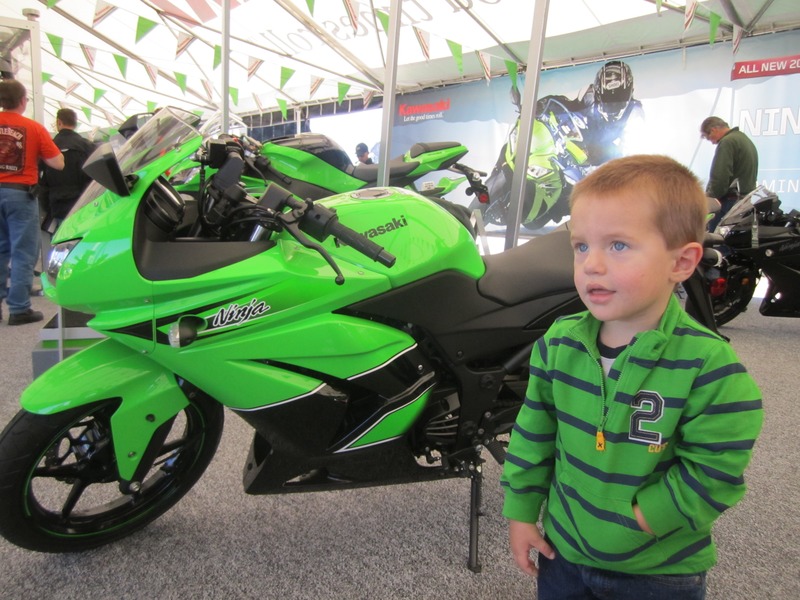 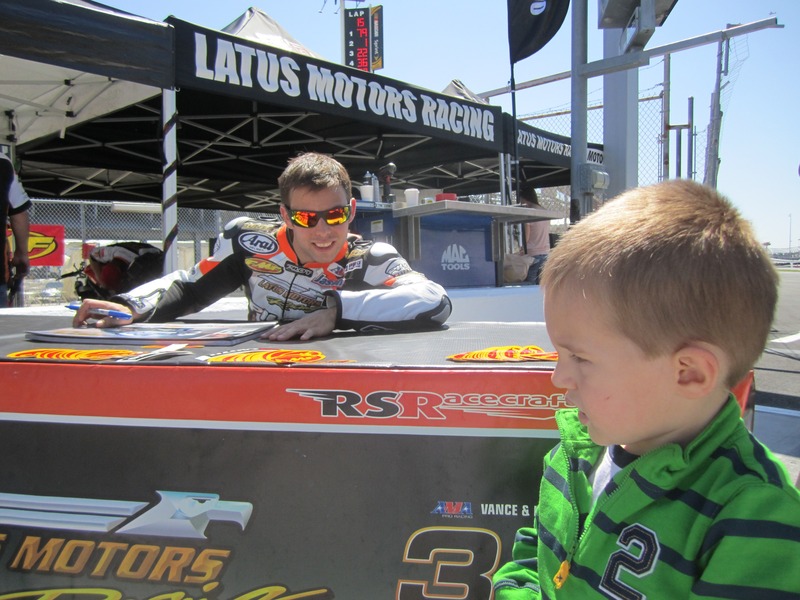 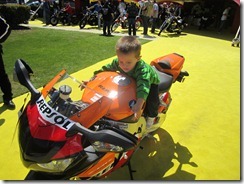 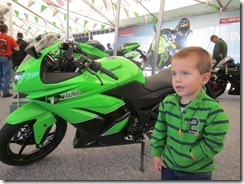 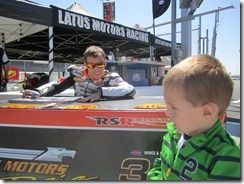 Very nice pit crew, Timmy got a bunch of stickers from Latus garage and got to hang out around the actual race bikes. 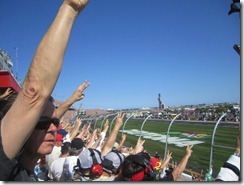 My only observation here is that the guy seemed like he was still in high school. 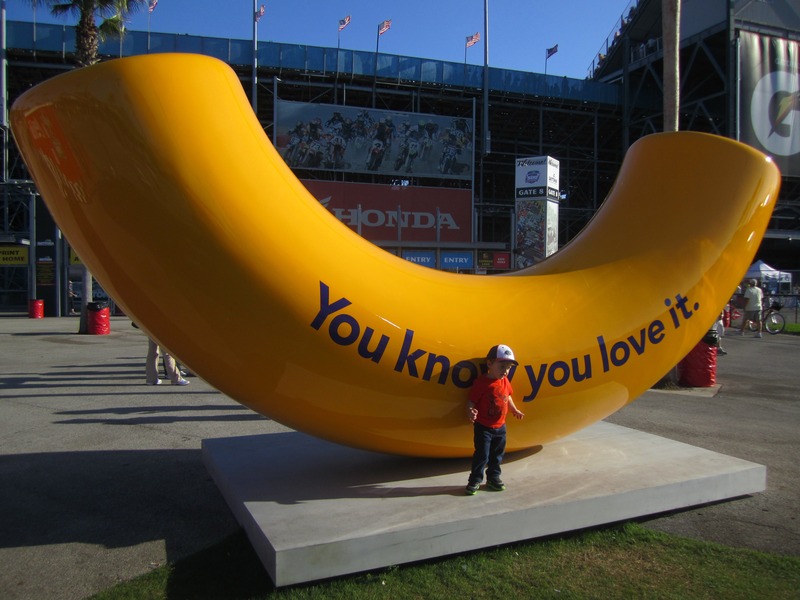 Maybe it’s just me. 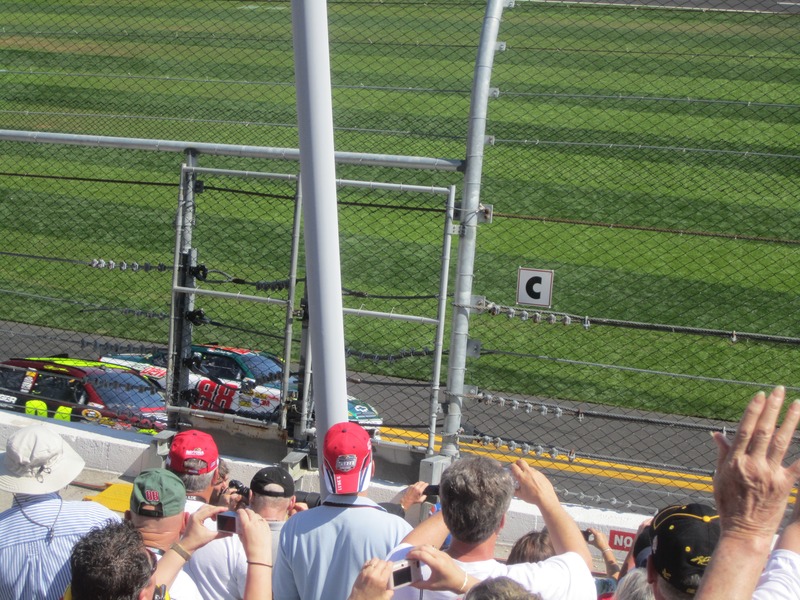 The race was amazing. 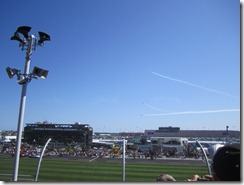 Unlike the Left, Left, Left, Left, Left snoozefest, there were plenty of turns, long and short stretches of the track. 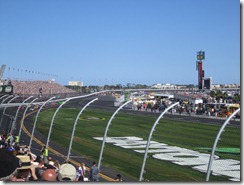 Racing at that speed heading towards a wall… it’s scary even from where I was sitting. 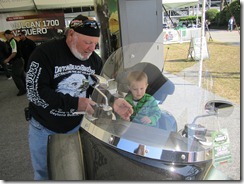 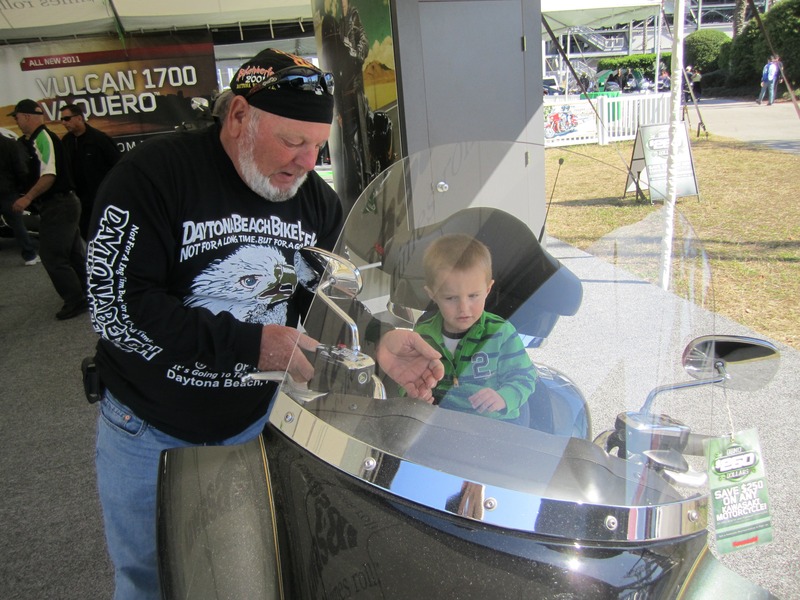 Back to Bikeweek stuff. 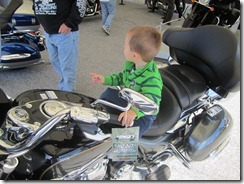 This sequence pretty much sums up the trip, everyone likes cute kids and bikers are a friendly bunch. 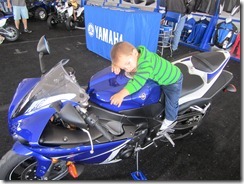 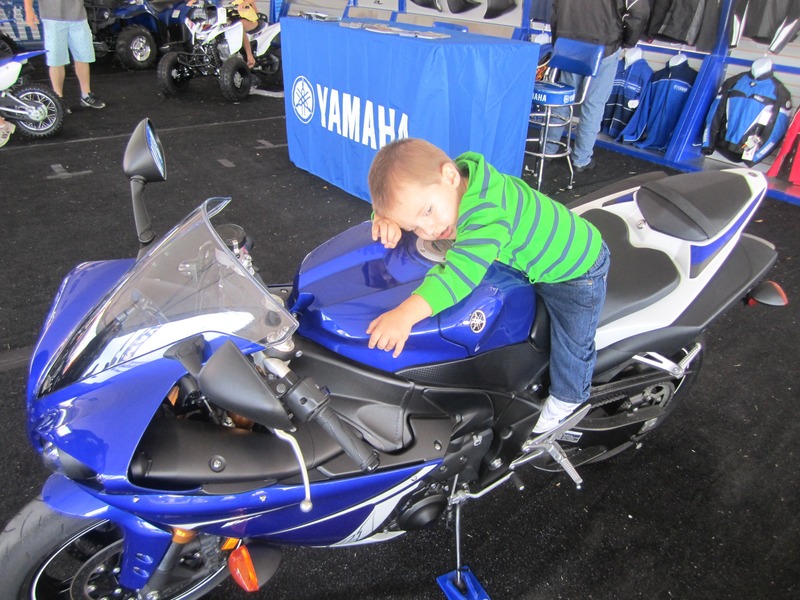 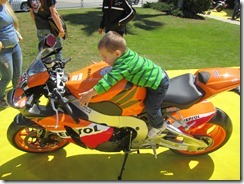 Timmy was sitting on this bike and complaining that he couldn’t make it go faster. 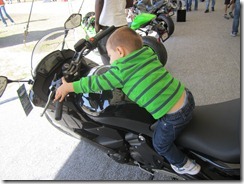 Biker overheard him and naturally, the two striked up a conversation. Father of the year material right there, it’s always OK to talk to strangers if they own a motorcycle. 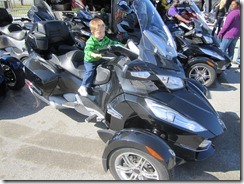 Anyhow, the two chatted, guy came over and turned the handles over so Timmy could reach the throttle. I think the smile in the last picture says it all. 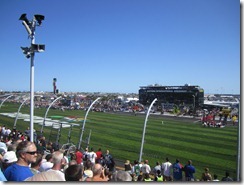 Very nice trip, next year.. A1A Unlike the NASCAR experience, I’d definitely go back for Daytona 200. Ever since Cars came out I’ve pretty much stamped my ticket to taking boys to Daytona 500 one day. 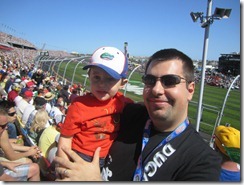 This was the year. 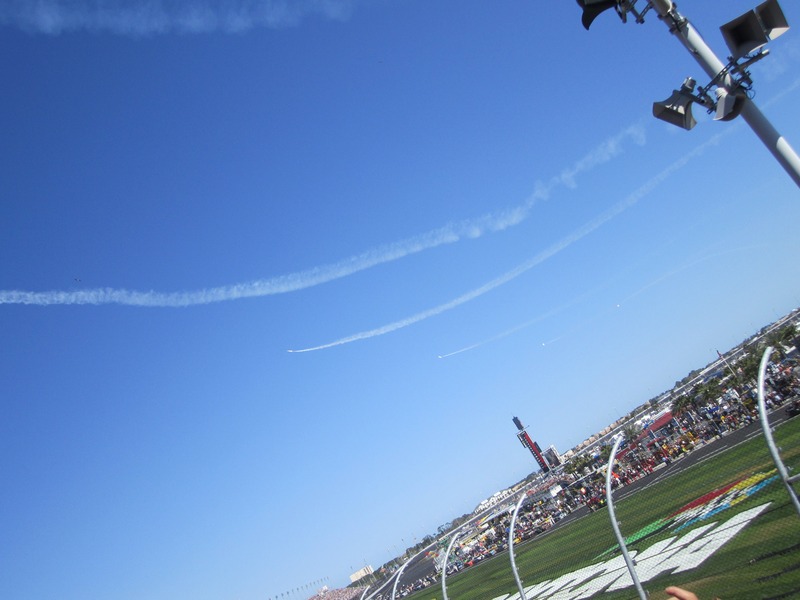 It is also the 10 year anniversary of Dale Earnhardt eating the wall at Daytona so there were quite a few memorial festivities around that. The pre-race festivities were awesome, pretty nice family atmosphere. Lot’s of cool stuff for the kids. 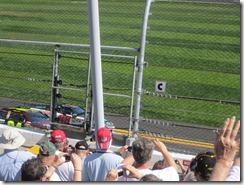 The race started and the noise is off the charts. 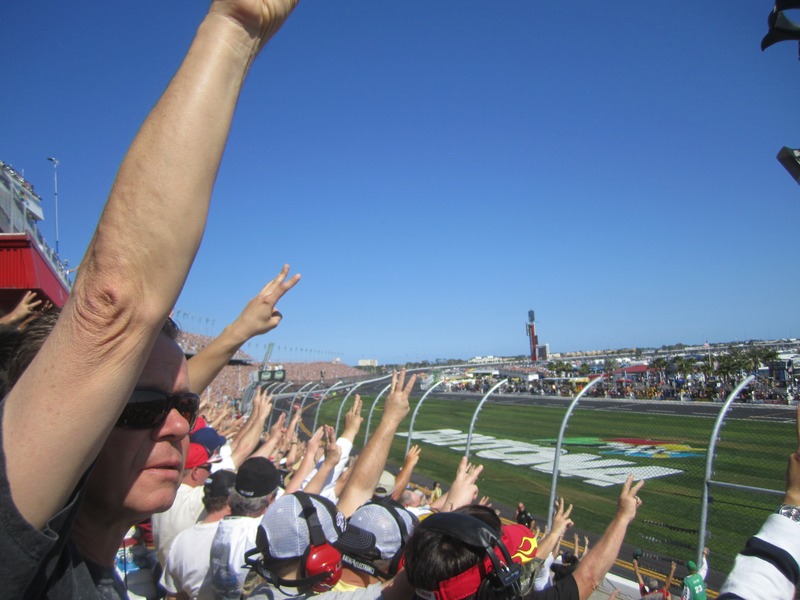 “Lap 3” was silent – no broadcast – and everyone had three fingers in the air. 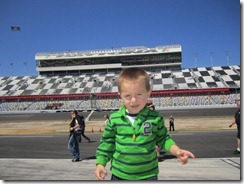 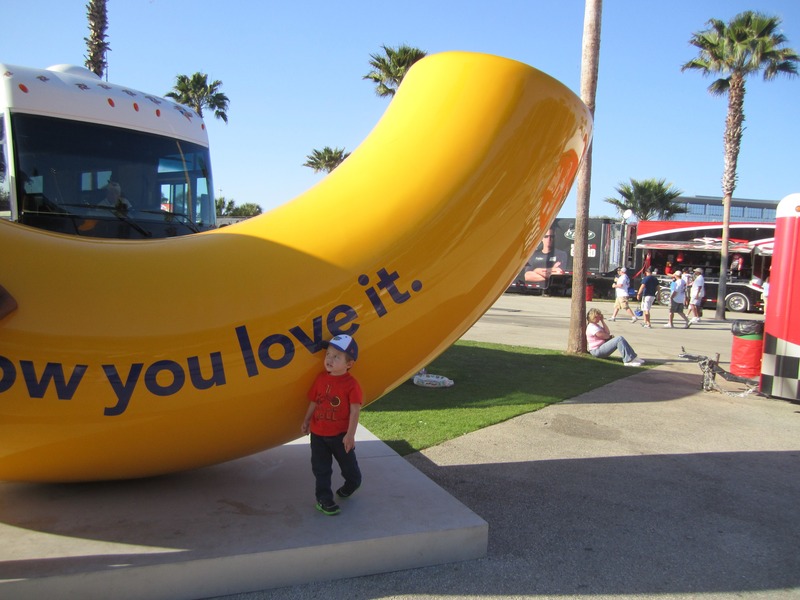 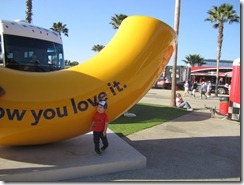 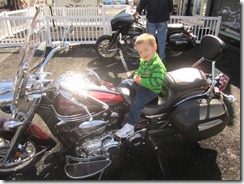 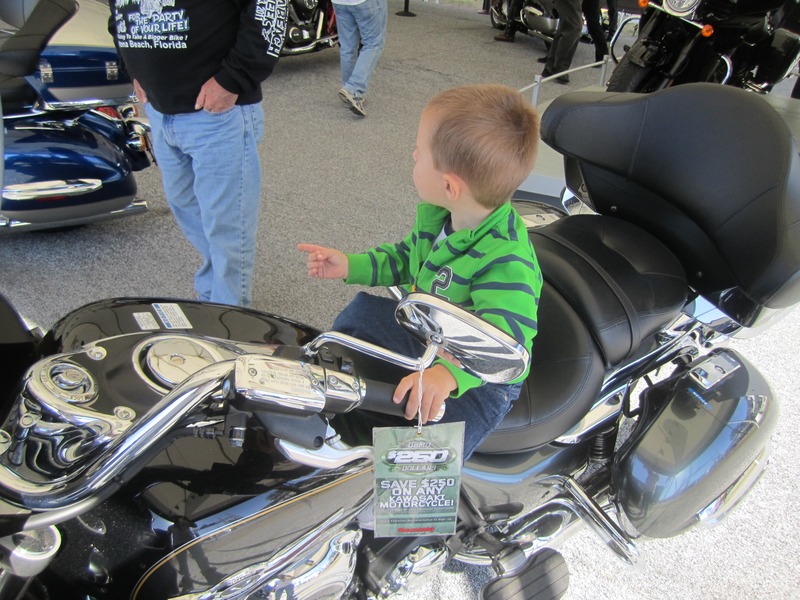 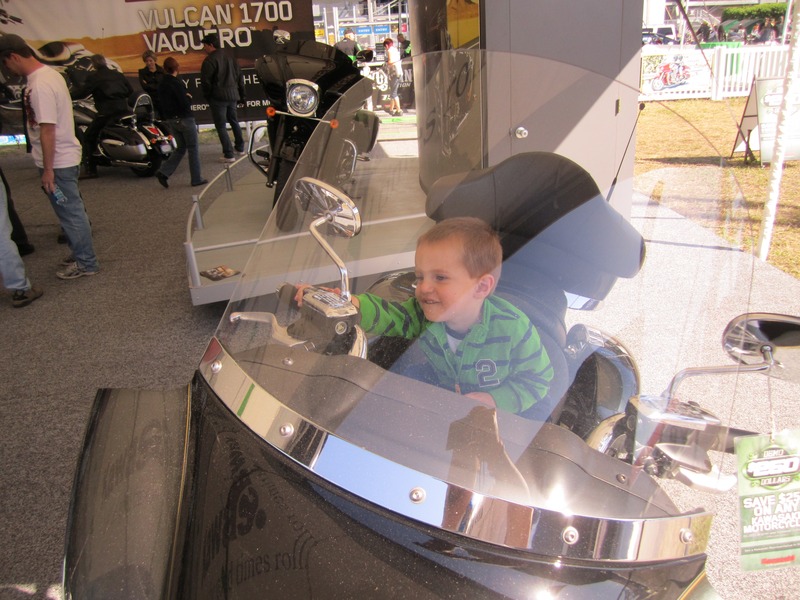 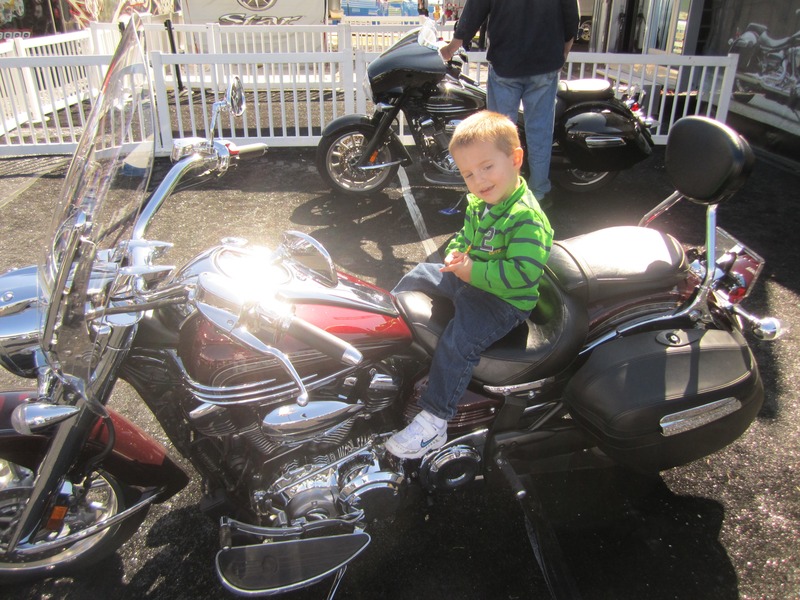 Timmy loved it and screamed every time he saw the cars looping back around. 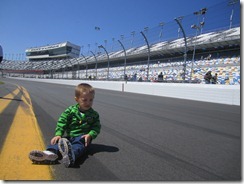 "Watching the paint dry” boring. 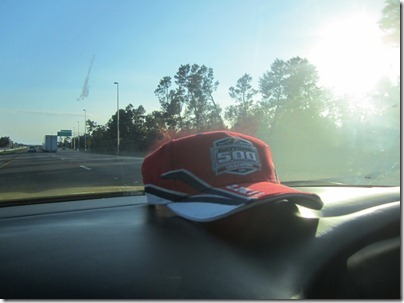 All in all, it was a fun trip. 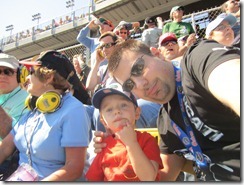 The pre-race stuff and the crowd were really cool. 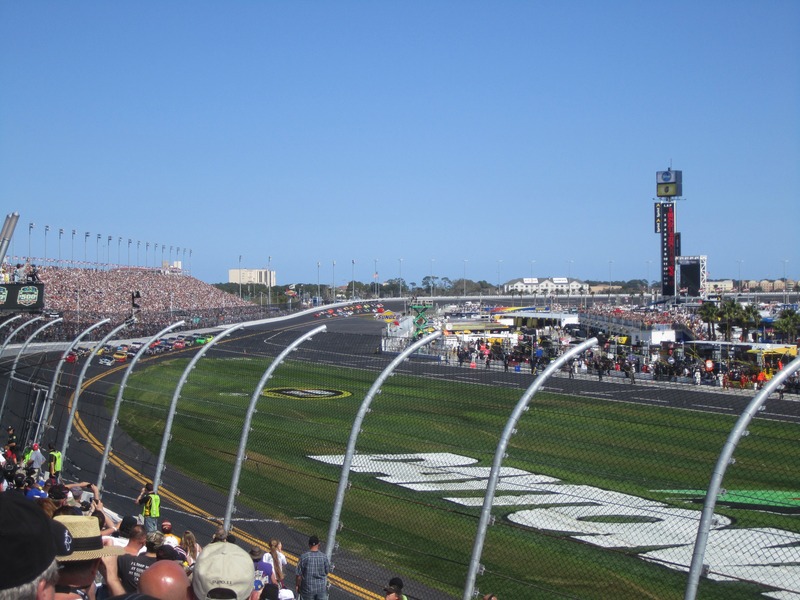 The race… as barely watchable as it is on TV, in person it’s about a thousand times worse. 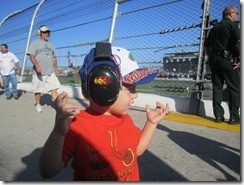 From now on, Mommy is in charge of NASCAR. 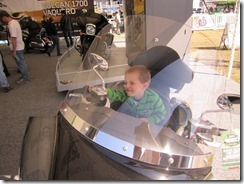 Daddy will take Formula 1.